My First Time is a regular feature in which writers talk about virgin experiences in their writing and publishing careers, ranging from their first rejection to the moment of holding their first published book in their hands. Today’s guest is Paulette Livers, author of the novel Cementville, a novel which opens in a small Kentucky town as coffins are making their way home from Vietnam, along with one remaining survivor, the now-maimed town quarterback recently rescued from a prison camp. 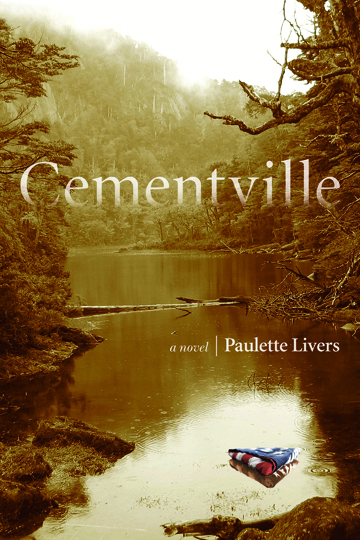 Cementville was the winner of the Elle Lettres Readers Prize and finalist for the Center for Fiction’s Flaherty Dunnan First Novel Prize, Chicago Writers Association Book of the Year, and the Kentucky Literary Award. 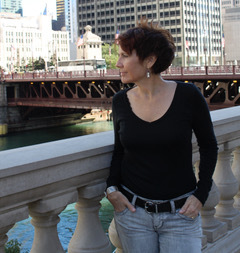 Paulette teaches at Story Studio and is Creative Director at Mighty Sword, a boutique writing and design studio serving writers and publishers around the country. Livers is a recipient of the Chicago Department of Cultural Affairs Artist Grant, and is a MacDowell Fellow. Please visit www.PauletteLivers.com to learn more about her works. With so many years spent making art and texts, countless firsts have come and gone: first workshop as my graduate program’s most nontraditional student, first contracts, first awarding of those coveted bona fides. There’s the first completed novel—that obligatory one-in-the-drawer; a second novel which would be the first published, to reasonable acclaim, and sad sales figures; and the first draft of a third novel, now in revisions after my agent’s close read. Until last fall there was one first I had not experienced: An up-close encounter with mortality. Oh sure, I’d gotten myself into dangerous scrapes: the near fatal car accident at 18. The heart-thumping race against a lightning storm while backpacking up a 14,000-foot peak in the Rockies. Class V rapids in the Grand Canyon. An idiotic rock-climbing venture with an “expert” whom every cell in my body told me not to trust. I consider myself a reasonable risk-taker with a faith in pushing physical and mental strength where it hasn’t gone before. After all, I’d always enjoyed perfect health. A doctor who examined me early last year said, “You’re trim, you’re active, and you have low blood pressure. You’ll live to be 100!” My body was the sturdy house for my mind, the dependable turtle shell from which I’d written and created for years. But the body is a fickle partner to the mind. Mine started to turn on me last September, when I learned the bronchitis I hadn’t been able to shake was actually pneumonia—and something else. Hospitalization, an isolation room (they suspected tuberculosis), and multiple tests later, we uncovered a mycobacterial colonization of my lungs, which had found its perfect habitat due to an incurable lung disease I didn’t even know I had. Bronchiectasis had killed my sister at age 32; not until I was diagnosed with it did I learn that the condition carries a familial connection. Another sister has been living with it and managing it for a couple of years now. A routine mammogram in October turned up something suspicious. Fast forward: biopsy, surgery, chemo, and at the end of June, the last radiation treatment. In the midst of all this, quarterly CT scans of my lungs showed a pesky nodule, and the word “biopsy” again hung over me. I was supposed to be celebrating freedom from breast cancer, and suddenly couldn’t be sure I was home free. You might be asking, What has this to do with firsts in writing? Almost everything I’ve ever written has dealt with death, either overtly or as a subtext. Coming from a very large extended family, I’ve encountered so many losses at this point, I probably (foolishly) believed I was inured to what the personal confrontation with mortality might do to notions about my own impermanence. Wedged in among medical appointments and new tests, surgeries and consultations, and injections of toxins no sane person would happily choose, daily writing practice morphed into a wholly unfamiliar mental beast. That third novel hung in a Twilight Zone world, its ending coming one sentence, one phrase, or even a single image at a time, little nuggets that two or three times a week glimmered weakly through the ever-present fatigue. I credit my hard-driving mother for the relentless worker I am. Moving into the reasonable expectations I would undoubtedly advise a sick friend to embrace has been a lesson in acceptance I didn’t even know I needed. No one’s to blame; there isn’t some supreme being who took time off from keeping the planets in orbit in order to stick it to Paulette. Illnesses happen to people every second of every day. I have health care in a country where that’s far from guaranteed. I have family and friends who love me. I have places like The MacDowell Colony, Vermont Studio Center, and Virginia Center for Creative Arts that will shelter and feed me so I can work without interruption. I have mobility, and a mind, and a body that, for all its insults and infidelities, is still not a total shambles of a house. Regardless of when my new novel eventually runs through a printing press, the planets are not likely to go whizzing off into the ether. Today an image. Tomorrow a phrase. By the end of the week, a sentence. At some point, Finis.